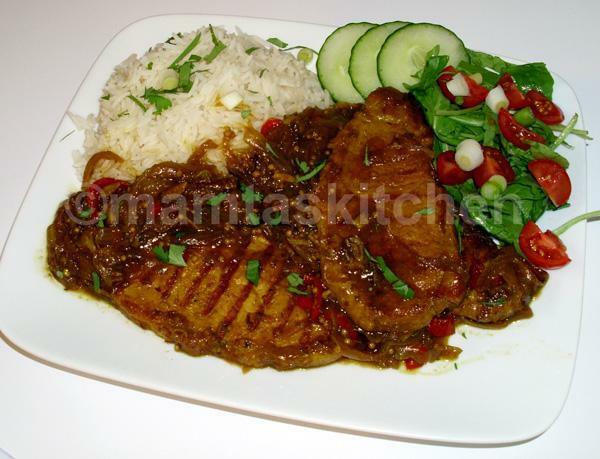 This isn't a "curry" recipe, its pork chops cooked with a curry style sauce. You serve the chops with a little of the strong, tasty sauce, rather than smothering the chops in it. It is a long list of ingredients, but most of it is just a collection of spices that are added in one go, a lot simpler to make than you think. You can use other meats than pork for this recipe. Serves 2-4 people, depending on the size of chops you have. Brown off the onions in a large roasting dish suitable for oven top cooking. Fry the chops in another frying/griddle pan, until they look browned. Keep to one side when done. Once the onions have softened and coloured, add the garlic and chilli pepper and allow them to soften. Add the chops to the onions. Add the spice mix (pepper, oregano, mustard seeds, cumin seeds, fenugreek, onion granules, turmeric, sea salt, chilli flakes, ginger powder and stir well in. Deglaze the pan in which you fried the pork chops with the vinegar. Add the stock (two stockpots mixed in hot water) and give a good stir. Add to chops. Place in the oven at about 180C/350F/Gas mark4 for about 1 hour, checking half way through and turn the chops over. If they are getting too dry near the end of cooking, add a little more hot water. Once both sides have taken on more colour and the sauce is thickened, serve hot. There is no reason why you can't use the roasting dish to brown the onions and put the chops directly into it after the onions were browned, if you wanted to save on washing up!